Tweets are mysterious things. They’re sometimes witty, usually banal, and often garbage. But if you’re Elon Musk, your tweets can have a very real impact on how companies are valued. For instance, one tweet from Musk last night wiped out $580 million from Samsung SDI’s market capitalization. No joke. Rumors had been swirling that Samsung SDI, a company associated with Samsung that makes batteries and displays, was working with Musk’s company Tesla for batteries in the upcoming Model 3 electric car. But Musk set the record straight on Twitter last night, explaining that the company was working exclusively with Panasonic. “Would like to clarify that Tesla is working exclusively with Panasonic for Model 3 cells. News articles claiming otherwise are incorrect,” Musk tweeted, dispelling the rumors. The belief had been that if Panasonic couldn’t handle producing enough batteries for the new Model 3, then perhaps Samsung’s SDI division would pick up the slack. That single clarifying tweet from Musk sent Samsung SDI’s stock plunging 8 percent this morning, losing roughly $580 million. Panasonic added about $800 million in the same period. 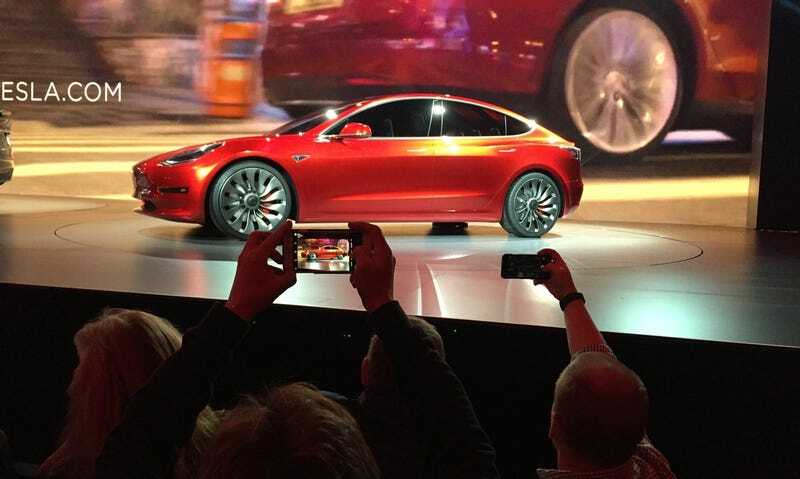 Investors, much like many car consumers, are obsessed with the potential for Tesla’s Model 3. The car is slated to be relatively affordable by luxury car standards. Until now, Tesla electric vehicles had largely been the realm of the super rich. But if Tesla can figure out how to take their tremendous branding cachet and turn it into something that middle class people can afford (without sacrificing its luxury appeal) then many investors are going to get very, very rich. Samsung, on the other hand, took a walloping over the head—all thanks to some rumors that turned out to be false. But if Musk’s Twitter account has that much power, we hope he has a strong password and two-factor authentication turned on. If Musk ever got hacked, it could send markets into a minor tailspin. Seriously, it’s happened before. Remember the time the stock market reacted to false news of President Obama’s assassination in 2013 after the Associated Press Twitter account got hacked? Update 3:35pm: Bloomberg has reported that Tesla may still be working with Samsung on their Energy products, meaning those Powerwalls and Powerpacks that people can use in their home and businesses for power storage. Correction 10:58am: The last paragraph of this post originally said that Panasonic had taken a walloping over the head. It was Samsung which took the walloping, obviously. But in reality, neither company possesses what could be described as “heads” in the traditional sense of the human anatomy, upon which they would take a walloping. So both are wrong and everything is bad. I regret the error.